FOR IMMEDIATE RELEASE: Rapoport Foundation Invests $25,000 to Sponsor the Summer Program for Boys & Girls Club of Falls County: Club Announces New Facility for Fall 2018 and Upcoming Golf Tournament. Pictured (left to right): Boys & Girls Clubs of Central Texas (BGCTX) Deputy CEO Calvin Darthard, Rapoport Foundation Grants Manager Casey Sadler, Boys & Girls Club of Falls County Board Members Jimi Lynn and Byrleen Terry, BGCTX CFO Brandon Fogle, BGCTX CEO Tiana Quick, Boys & Girls Club of Falls County Staff and Club members. Boys & Girls Clubs of Central Texas announced today, a series of updates pertaining to their affiliate organization - Boys & Girls Club of Falls County. Boys & Girls Club of Falls County, who joined the Central Texas family of Clubs in 2014, have provided an invaluable service to the youth of Marlin and Falls County for many years despite challenging financial circumstances and a deteriorating Club facility. That service, in pursuit of the Club’s mission – to inspire, and enable all young people, especially those who need us most, to reach their full potential as productive, caring and responsible citizens – has been sustained and preserved by the Waco based Rapoport Foundation for many years. “We have seen the need for - and impact of - strong youth development organizations in communities like Falls County and we are honored to be in a position to provide support to the Boys and Girls Club to serve more youth this summer,” said Rapoport Foundation’s Grants Manager, Casey Sadler. Thanks to the Rapoport Foundation’s investment in the Boys and Girls Club of Falls County’s Summer Program, Club members from throughout the community will be able to find their ‘Place to Become’ 5-days a week this summer at the 207 Kendrick St Club site. 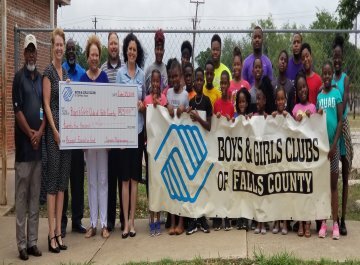 In addition to the new investment, Boys and Girls Club of Falls County Board Chair, Byrleen Terry announced that the Club would soon move to a new home. “After extensive discussion with Marlin ISD and in light of recent infrastructure issues with our current Club, we are pleased to report that the Boys & Girls Club of Falls County will begin operating after-school programs at the Marlin ISD Primary Campus at the start of the 2018 / 2019 school year.